At the end of September, Dayna and I kicked off the Great Plains Cultivating Resilience video with a day of filming with Resilient Agriculture farmer Bob Quinn at Quinn’s Farm and Ranch in Big Sandy, Montana. Videographer Dave Pecunies from Mahoosic Productions completed the production team for this shoot. Bob took such good care of us all day and he was such a trooper with the filming! We arrived before dawn to scope out locations and capture some footage of the sun rising over Bob’s 4500 acres of dryland grain fields. After 2 hours of work, Bob invited us into his kitchen and made up a batch of his famous sourdough Kamut pancakes for breakfast, giving us a step-by-step tutorial. We enjoyed a zesty breakfast drink made from sour cherries and apples grown in Bob’s experimental fruit orchard. After breakfast, we headed out to interview Bob about the changes that he has seen in weather over the 43 years he has managed the farm, the adaptations that he has made to respond to those changes, and his concerns about the barriers to farm-based innovation created by federal government programs. Bob enjoyed piloting Dave’s quadcopter as we captured aerial footage of the landscape, antelopes, tractors and all! Bob put us to work gathering vegetables for a late lunch from his kitchen garden and his experimental dryland vegetable fields. Bob introduced us to ground cherries (yum!) and we picked tomatoes, green peppers, cucumbers, squash, potatoes, and arugula. Bob whipped up a tasty vegetarian lunch cooked in safflower oil grown and processed on his farm. After lunch we filmed at the safflower processing plant at the farm and then headed downtown to do some filming at Bob’s newest venture, a healthy and very tasty snack food called Cracklin’ Kamut. Look for it soon at your favorite food store! 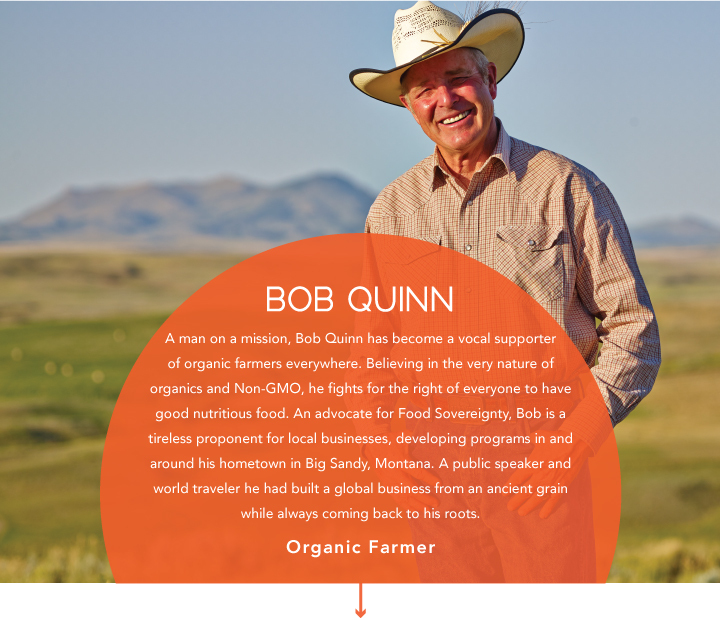 Thank you to Bob Quinn and his family for a delightful and tasty visit to Quinn Farm and Ranch!